College coaches consider thousands of athletes for their rosters every year. They attend showcase camps, review video, read emails and talk with their trusted sources about which athletes might make sense for their team. The recruiting process for a college coach takes a tremendous amount of time. For that reason, nearly every college coach in the country has a few warning signs or “red flags” they look for when considering a high school athlete. If they see or hear about a red flag for a player, that player’s name may get scratched off the recruiting list almost immediately. It’s one less player they have to consider. College coaches want hard working, selfless players who put the team first. Every recruit should know the red flags coaches notice. Here are the top 10 recruiting “red flags” we’ve heard from college coaches. For the most part, the first warning sign on most college coaches “red flag list” is laziness. College coaches want hard workers that are all about the team. You really can’t compete at the college level unless you’re willing to work. If you don’t give 100% effort every minute of every game, college coaches will notice. And, if mom or dad is carrying your bat bags around the park while you’re staring at your phone, college coaches won’t waste their time recruiting you, because that’s not how it works at the next level. It’s easy for a college coach to spot a selfish player. Selfish players are not team players and are not good teammates. They’re all about themselves and are more worried about how their uniform looks than how the team is playing. Keep in mind that it only takes one time for a coach to be turned off by a selfish player. For every talented kid who is selfish, there are two other talented kids who are not. If you want to be successful in athletics and a player that a college coach will be interested in, you have to respect your parents, your coach, your teammates and the game. You may not agree with the punishment your parents deem necessary or the playing time decisions made by your coach, but you have to respect their authority. To me, respecting the game means maintaining your values as you play to win. It’s easy for a college coach to identify players that don’t respect their parents, their coach, their teammates and/or their sport. If you don’t respect any one of these, then don’t expect a scholarship. At the end of the day, showing respect to all of the above shows that you respect yourself. Like it or not, college coaches will assume that how you act in high school is how you will act on campus. So, if it’s apparent to a coach that you don’t care about academics, then he or she will assume you will struggle in the classroom in college. Also, if you’re constantly in trouble, or you complain to coaches and officials, then most college coaches will scratch you off their recruiting list. Make the commitment as a freshman to do things the right way on the field, in the classroom and in your personal life. Athletes who are just lukewarm to the idea of playing their sport in college are going to be shocked by the commitment it takes at the next level. If you don’t love your sport in high school, then the commitment it takes to play in college is not a fit for you. A coach may not be able to tell if you love your sport by watching you play, but once a conversation starts it becomes obvious. Passion is a must for every student-athlete who wants to play in college. You’ve probably read our articles describing the kind of parents college coaches try to avoid. Helicopter Parents, Lawnmower Parents and Sports Agent Parents are becoming more and more prevalent these days. You know the parents I’m talking about. You don’t want to sit next to them at games, they constantly complain about the coaching and believe their athlete never makes a mistake. College coaches notice these parents too and if possible tend to stay away from them. If a player is worried about the other players at his or her position before arriving on campus, then apparently that athlete is not ready to compete. Competition breeds success. In college, every player has to battle daily for playing time and quite frankly to keep their roster spot. There is a time and a place for everything. The time and place to talk scholarship money with a college coach is not in the first meeting. In fact, when a college coach is ready to talk scholarship, he or she will bring it up. A college coach’s first impression of you will most likely happen sooner than you think. In fact, it might have already happened. College coaches generally do their homework on recruits well before the first phone call or email and they most likely will start with your social media accounts. There have been thousands of athletes scratched off recruiting lists based just on their social media accounts. In fact, if a coach doesn’t like your Twitter handle he or she may not even consider you as a prospect. The above red flags aren’t the only warning signs a college coach might notice, but they are the 10 we hear most often. 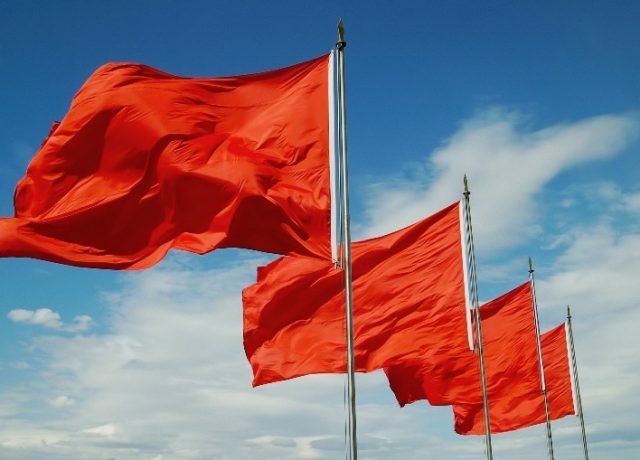 A red flag doesn’t necessarily mean that a coach will stop recruiting an athlete (although it’s possible), but it is a cause for concern. It provides a reason for a college coach to tap the brakes a little and investigate further. Knowing the “red flags” will help you avoid them and avoiding them might be the difference between a coach calling you or passing on you.